Home > View All Products > Giant Mallo Cups - 24 ct.
Mallo Cups are a coveted American made candy favorite by people from around the world. This candy is the combination of pure milk chocolate with a creamy Mallo center that is sure to satisfy any sweet tooth. Mallo Cups were the first cup candy in the United States and are still one of the most popular. Finally something awesome that I can snack. I a celiac and miss out on a lot of great snacks and found Mallo cups last night at the store. They are delicious and did not cause any digestive problems. I am going back to the store to buy more today! Thank you for keeping it Gluten Free! WHEN WILL THE GIANT DARK CHOCOLATE MALLO CUPS RETURN? 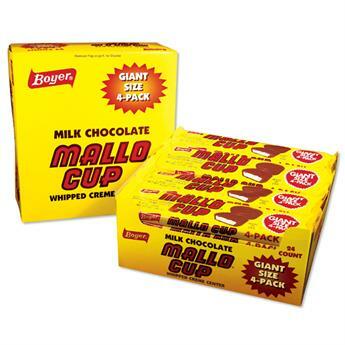 I love Mallo cups, but I also like the dark Chocolate version, which I can't find in stores in my area. I used to years ago, but not now. Could you help me out with this please? By shipping them to stores in this area? Thank you.